Within the Ojai Valley Land Conservancy’s broader “area of interest” of the Ventura River watershed upstream of Foster Park, four conservation priorities have been identified for our focus in our 10-year strategic plan spanning 2010-2020. These four conservation priorities were selected based on their resource values, opportunity and momentum. The Ventura River corridor offers the greatest concentration of resource values of any area in the Ojai Valley. The collection of threatened and endangered species, views, the significance of the river’s water supply for our agricultural and residential communities and recreational/ educational opportunities along the Ventura River are unsurpassed in OVLC’s area of interest. The term “conservation area” is chosen to reflect that this waterway provides a range of benefits that is not limited to its habitat values. 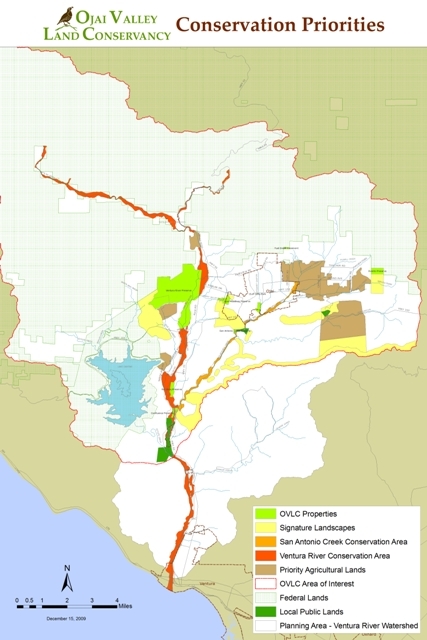 In this priority area, OVLC will seek to permanently protect – restoring as necessary – all land in the flood plain of the Ventura River, its major tributaries and adjacent land as appropriate in order to permanently secure the habitat, views and recreational opportunities this land offers. Of the 2,020 acres of new protection planned for in the 2010 to 2020 time frame, 700 to 900 acres of that goal may be in the Ventura River Conservation Area and of that an estimated 20-30% may need some degree of restoration. Similar to the Ventura River Conservation Area, the San Antonio Creek corridor provides excellent habitat values and is a significant travel corridor in the Ojai Valley. Although San Antonio Creek is a tributary of the Ventura River and is technically part of priority area #1, the outstanding resources and prominence of this corridor is naming this as a priority area. In this priority area, OVLC will seek to permanently protect – restoring as necessary – all the land in the flood plain of the San Antonio Creek and adjacent land as appropriate, to permanently safeguard habitat, views and recreational opportunities as they become available. Of the 2,020 acres, 500 to 700 of that goal may be in the San Antonio Creek Conservation Area and of that an estimated 10% may need some degree of restoration. Agricultural lands are an integral part of the identity of the Ojai Valley and the permanent protection of sustainable agriculture continues as a priority for the Ojai Valley Land Conservancy. OVLC identified important agricultural lands on which it will focus its conservation efforts in the next ten years. The primary focus will be orchards on the East End of the valley, ranch land, orchards in Upper Ojai and other important agricultural lands. Of the 2,020 acres, 200 to 400 of that goal may be represented by Agricultural Lands. “Signature Landscapes” are a collection of lands which share commonality of being identified on the short list of the Ojai Valley’s most special places. Signature Landscapes fall into a few categories, including “gateway” views along primary travel routes, scenic lands and other places of particular ecological value like the Ojai Meadows Preserve. The OVLC will complete restoration of the meadow to its former state as a naturally functioning wetland with associated natural communities, expanding the geographical extent of this project as appropriate and utilizing an exemplary interpretation program to enhance the community’s appreciation of this special place. Of the 2,020 acres, 300 to 500 of that goal may be in Signature Landscapes and of that an estimated 15-20% may need some degree of restoration. To help refine our specific protection priorities within each of the conservation priority areas and to improve the way we design our protection projects, OVLC will convene and/or participate in a watershed-wide conservation planning process with our key watershed partners such as the California Coastal Conservancy. Our success protecting fish habitat in the upper watershed is dependent upon actions taking place outside OVLC’s area of interest in the lower portion of the watershed below Foster Park. It will be important that our strategies and projects are designed to address these needs and take advantage of opportunities as appropriate. In addition to providing the benefit of more effective strategies and better designed projects, utilizing a watershed-wide planning approach will build credibility with our funders and will make it easier to secure funding for our work. The Ojai Valley Land Conservancy does hold conservation easements and in many cases donating or selling these conservation or agricultural conservation easements can provide a substantial tax benefit. For more information on the many ways you can contribute to the protection of Ojai’s future through land preservation, please contact our Executive Director Brian Stark at brian@ovlc.org or call (805) 649-6852 ext 1.